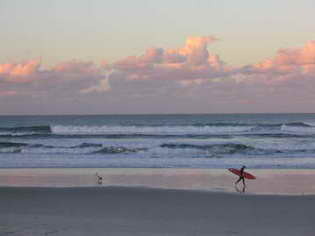 Lennox Heads accommodation, beachfront accomodation in Lennox Head, apartments, tours and attractions. Visitor information for Lennox Head NSW, 2478, New South Wales, Australia. Very handy to Ballina and Byron Bay, Lennox Head (NOT Lennox Heads) is a beach resort town with about 6,100 permanent residents, situated at the southern end of Seven Mile Beach. Visitors are attracted here by the great weather, incredible scenery and splendid beaches, famous for their surfing and fishing. This is a place of wide open spaces and vast vistas. Just start start walking north along Seven Mile Beach towards Broken Head, if you want to feel a bit lonely. At the northern end of the town, Lake Ainsworth is reknowned as a freshwater recreational area ideal for families, just 50 metres across from the beach. Accommodation includes motels, holiday flats, caravan park, backpacker hostel, holiday apartments and resort style complexes. Local real estate agents provide holiday rental services. Al fresco cafes and restuarants almost outnumber the accommodation choices, so if you're into a total "do-nothing" and completely relax holiday, this is the place do it! Most tours operate from Byron Bay to the north. See our Local Tours & Attractions listings below for a sampling of the wide variety of available options. Lake Ainsworth: Just 50 metres from the Pacific Ocean, Lake Ainsworth is a unique fresh water lake, with a characteristic dark tannin colour which comes from the leaves and roots of the ti- trees overhanging and surrounding it. It is a very popular swimming and sailing spot for families and visitors, with catamarans and wind surfers for hire during holidays and most weekends. Facilities include a picnic area, BBQ facilities, car park and public toilets. The equally popular Lennox Community Market is held here on the 2nd and 5th Sunday of the month, with locals and visitors alike flocking to stock up on local produce and hand made gifts, and treat themselves to local cuisine. Lennox Head Aboriginal Area: Located in Gibbon Street, an Aboriginal bora ground and sacred site is situated in the heart of Lennox Head. Only one of the two bora rings originally on the site remains, and the earthen mound defining it is clearly visible. The bora ground is tangible evidence of the rich Arakwal culture and was used for ceremonial purposes and as a male initiation site. It remains a significant sacred site for the Arakwal and Bundjalung people, and protects part of the region's coastal heath and melaleuca plant communities. As with many other coastal headlands in the region, good bird watching is available at any time, but in Spring an explosion of heath land wildflowers attracts birds in greater numbers, including Golden-headed Cisticolas, Red-backed Fairy-wrens, Superb Fairy-wrens, Brown, Scarlet and White-cheeked Honeyeaters, Tawny Grassbirds, Little Wattlebirds, while Brahminy and Whistling Kites soar on the rocky cliff updrafts. An off street car park is available. Named after one of Lennox Head's pioneers, coastal views stretch north to Byron Bay, with Cape Byron featuring prominently. It's also a great spot for whale watching during their seasonal migration, or you can admire the hang gliders doing their best to imitate the Sea eagles and Brahminy Kites, who sometimes almost seem to delight in showing off how it's really done. Picnic and barbecue facilities are available. Rainforests and Reserves: The rainforests are accessible either via the Pacific Highway or an extensive choice of rural roads, for those who enjoy scenic drives. Broken Head Nature Reserve is 10 minutes drive to the north, or you can take a 4 wheel drive tour with a National Parks approved or ecotourism accredited tour operator to the World Heritage listed Border Group of the Gondwana Rainforests of Australia, only an hour's drive away through the pastures and macadamia plantations via Mullumbimby and Nimbin. Seven Mile Beach: Sweeping north toward Broken Head, Seven Mile Beach is characterised by sand dunes and coastal forests, some of which are listed as endangered ecological communities. Coastal heath is dominated by banksias and wild flowers, which bloom from late winter through to summer. These, along with stands of scribbly gum and paperbarks, attract large numbers of insects, birds and native animals to inhabit the area. Facilities include a picnic area, BBQ facilities, car park and public toilets. Cape Byron Marine Park covers approximately 22,700 hectares, extending from Brunswick Heads in the north to Lennox Head, and from the mean high water mark to three nautical miles offshore. Popular for snorkelling, "The Moat" is a sheltered, shallow and accessible inter-tidal area along Seven Mile Beach, where diverse marine flora and fauna communities live. Surfing: Surfers come year round for the beach and point breaks, and it's one of the reasons there are two major surfing competitions held here each year. Seven Mile Beach and Skennars Beach offer left and right beach breaks from 2-2.5m on a sandy bottom, while the point is a challenging right hand break up to 4m on sandy/rock bottom, with "Boulders" offering similar conditions on a slightly smaller (to 3m) swell. Getting to the region is easy: Lennox Head is approximately 780 kilometres - about 10 hours drive north from Sydney and about 90 minutes drive south from Brisbane, via the Pacific Highway. Driving options include the Pacific Highway in New South Wales, and Pacific Motorway from Queensland. Lennox head is well serviced with daily airport transfer services between Ballina/Byron Gateway Airport and Gold Coast Airport, with some shuttles also available to Brisbane International Airport. Visit Gold Coast Airport Transfer Services for more information. Countrylink interstate coach stops at Alstonville, Ballina, Lennox Head, Wardell and Wollongbar for rail connections to Brisbane, Sydney and Melbourne, and connecting with daily or overnight train service from Sydney to Brisbane via coach transfer to Casino. Visit Ballina Shire - Transport Services Information for more transport information, including trains, coach and local bus schedules, taxis, airport, and transfer services for Ballina and surrounding localities, including Ballina Airport, CBD, Lennox Head, Suffolk Park, Byron Bay and Mullumbimby.